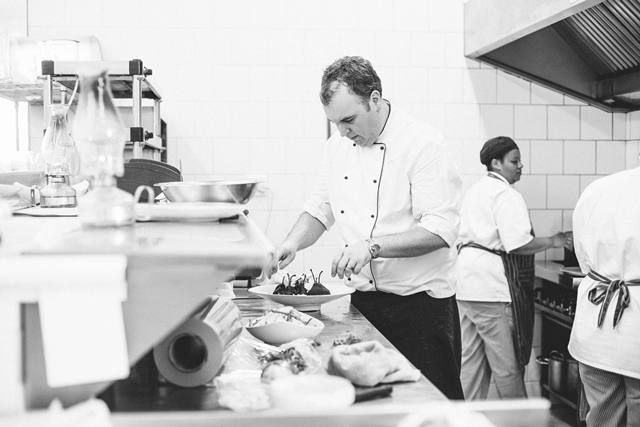 London trained Frans Groenewald is the Executive Chef / Owner at Gabriëlskloof Restaurant. He is truly passionate about food which comes through as we sit at the table talking to him. Frans has answered the following questions about himself, and the food he loves to cook. My parents, who also run a catering company, Kevin Warwick from Warwick Chef School in Hermanus as well as Roger Verge who has sadly past recently. Helping my parents in their business. Beside my knifes, my pasta maker and ice cream machine. I hate it when my team eats chewing gum………. My first evening at Roger Verge at the chefs table!!!! Mmmmm I like to try most things once, but will not do insects. To have a year in Italy or France in the country side and cook with my beautiful wife and family. Treat ingredients with respect and cook from the heart. Cooking is not a job, but a way of life. Come and share in our life at Gabriëlskloof. Disclosure: This interview was facilitated by Leanne from Random Hat Communications. The photograph was provided to me. This post is in line with my blogging policy. Such a great interview!! My favourite things also includes Maldon salt and fresh herbs! I have never tried their olive oil! I love reading your interviews with these amazing chefs. It’s always interesting to see the story behind what started their business. I would not even try! This is so fun!! I love how he’s willing to cook with almost everything, except insects! I totally hear that!! 🙂 …and yummmmmmmm I love fresh herbs like thyme! So healthy and delicious! Thyme is my favourite herb as well! Always nice reading your interviews Tandy.